Entropy is a law of thermodynamics, which in its simplest terms states that energy systems tend to move from order to chaos. I see this in my environment every day ... it takes energy to keep the piles at bay. Turn my back and a corner tweets to the world: come fill me! And it does, suddenly shoes, books, magazines, empty frames, jackets and dog toys have come out of their hidey holes and are romping about in orgiastic exuberance. Wait too long and all the corners are full and the party is dancing out into the middle of the room and I'm forced into fight or flight. Some people deal with SAD (seasonal affective disorder) when winter days reduce the available light; I deal with EAD (entropy affective disorder) when the piles begin to topple over and multiply. When all the surfaces around me become cluttered and the corners rounded with piles, I find it hard to breathe, think and create. This is an issue for someone who is by nature not a tidy person. I have two main work spaces ... my office and a comfy chair in my bedroom. I lost my office months ago to the forces of evil clutter and the edges of my bedroom have been slowly rounding off with piles. So, this week, as part of my Creativity Cleanse, I've been taking back my space. A couple of days ago I reclaimed my office ... it's a lovely space with lots of windows and light and I can now sit there and feel expanded rather than contracted. This morning I rounded up the pile of shoes that has been growing in my bedroom. They fought me all the way but I corralled them into a box and stuffed them away in a closet. Then I topped it off by removing the fingerprints from the mirrored sliding glass door. I'm sitting in my bedroom chair writing this and my whole body feels lighter ... except now I'm looking at a pile of *very* unused exercise equipment that has taken root in another corner, and the "catch-all" chest beside me is piling up. Sigh. It takes energy to keep pushing back the forces of darkness in order to let the light of creativity shine through. 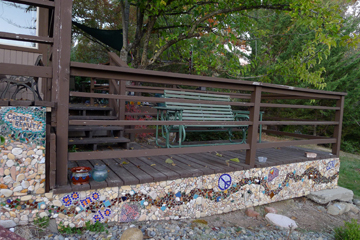 About this image: This is the current state of the mosaic rock wall I am doing around my deck. The rain and winter season has arrived so I won't make much progress on the 40' still left till do until next year. your wall is amazing... and you are motivating me with the rounded corners.. books in our bedroom, on chairs and tables, the studio, and the living room... I just try to keep the dining room table clear..My steps are more like baby steps... goal next year, complete two UFO's,, of course still work on new works! Love your "wall", it is amazing! The mosaic wall is wonderful, Joyce. I can imagine how light might hit it and cause the stones to shimmer. We all at one time or another have had exercise equipment sitting unused. I got rid of mine a while ago, finding good walks several times a day are more helpful than prospective workouts. Why Do People Buy Art? Creativity Cleanse: Day 2/21 It's Not Over! The Advantages of Being an "Ancient Artist"